My birthday is only a couple days away! Here are a few things I'm wishing for, or more realistically, will buy for myself under the guise of birthday presents. You totally need that anchor bracelet! It would go so well with your belt! Love that charming anchor bracelet. I want to get it for my friend for her birthday! i have those shorts in pants form!! i love them!! I love that Joe Fresh dress...you absolutely need to get that. I love those floral shorts! Hope you get everything on your wish list! Yes! That bracelet is SO you! Im totally smitten with that coral dress. What a beauty!!! Kisses, lovely. I love that shift dress! Love all these choices! Especially the floral shorts! I definitely went a little shopping crazy during my birthday month...haha. Love the Joe fresh dress. Would sure recommend getting the Old navy dress,fits so true to size and is very versatile. I dressed up mine as here http://www.myriadmusings.net/2013/04/a-weekend-of-easter-extravaganza.html. Wish you a Very Happy Birthday in advance. Great list, no matter how you receive them. Especially love that Joe Fresh/JCP dress! FANTASTIC outfits! you have amazing taste in clothing! oh yes, treat yourself with a nice birthday present, Lyddie! I love the dresses! 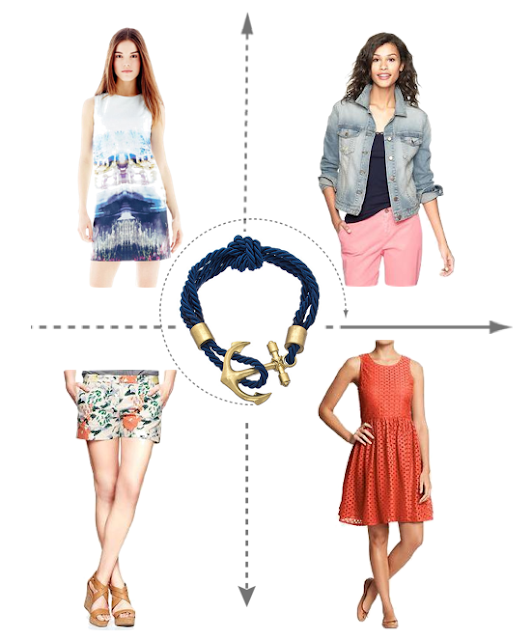 Great picks, especially love that anchor bracelet! Happy birthday! That Old Navy dress is so cute! They have the best stuff lately. I'm early but Happy Birthday. The items on your wish list are beautiful. I really love the first dress and that bracelet. Happy soon-to-be birthday! I think you'd look fantastic in that ON eyelet dress! happy early birthday hope you get all of these items and more! really cool selection! happy early birthday! That's so awesome! I love your concept - at www.lessismorebeauty.com, we want more quality for less money... I'm definitely going to follow this blog! Hope you get something from your bday wish list! All of these pieces look great. I especially like the floral shorts. You deserve them all..... which ones did you buy ?